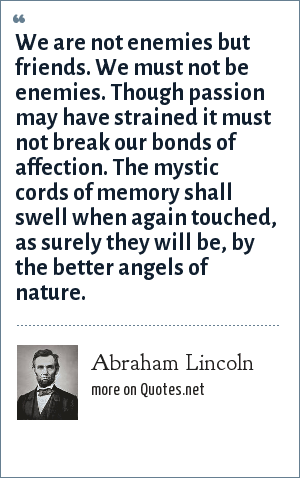 Abraham Lincoln: We are not enemies but friends. We must not be enemies. Though passion may have strained it must not break our bonds of affection. The mystic cords of memory shall swell when again touched, as surely they will be, by the better angels of nature. We are not enemies but friends. We must not be enemies. Though passion may have strained it must not break our bonds of affection. The mystic cords of memory shall swell when again touched, as surely they will be, by the better angels of nature. Abraham Lincoln was the 16th President of the United States, serving from March 1861 until his assassination in April 1865. "Abraham Lincoln Quotes." Quotes.net. STANDS4 LLC, 2019. Web. 23 Apr. 2019. <https://www.quotes.net/quote/41283>.